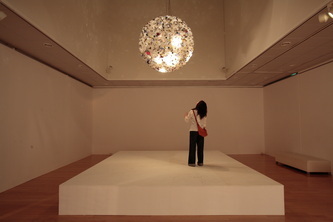 The work consists in gathering and connecting used light bulbs, to form a large sphere. 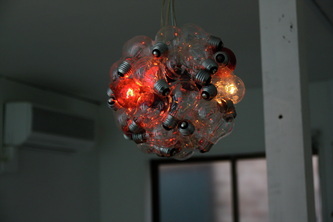 Some of the small bulbs light up repeatedly, similarly to deep breathing. 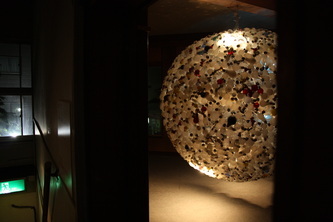 Each bulb implies the memories of a domestic environment or a shopping district, that it once lit up. The collection of incandescent light bulbs were announced via ads and websites to a shopping district, institutions and communities. 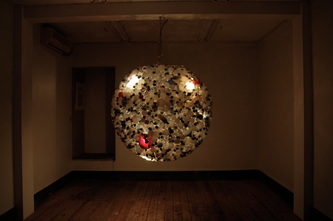 At the end of the process, the work constituted a symbol for the space and will be followed by an event program entitled “Akarino Lounge”, to establish a cross-cultural exchange through the intermedium of a café, music and dance.